Hudson's Bay has a hot one-day deal today! 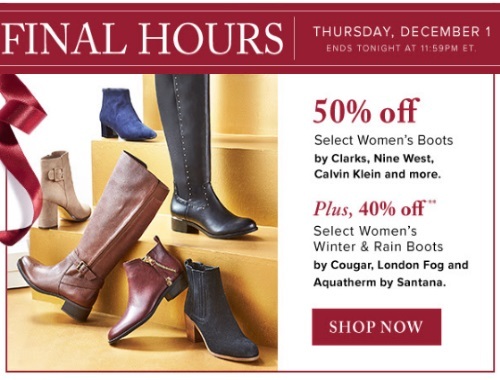 Save 50% off select Women's Boots by Clarks, Nine West, Calvin Klein and more! Also save 40% off select Women's Winter and Rain Boots by Cougar, London Fog and Aquatherm by Santana. Offer is valid today only, Thursday, December 1 until 11:59pm ET.